Most of us have dealt with dry hair, a dry scalp, or both at some point. First there’s the static electricity standing-on-end look, then there’s the itching — just there, above the ear, no, no wait, over here by the neck, up, up, just a little more — then, if you’re really lucky, there’s the dandruff. Dry hair and even dandruff have a myriad of causes and solutions. You need to figure out what’s happening to the natural oils your scalp produces to keep your hair healthy, and then you need to figure out how to replenish and replace that moisture in order to get rid of dry hair. Overwashing and overbrushing can irritate your scalp and dry out the natural oils that keep your hair feeling soft and moisturized. If you wash your hair every day, try cutting back to every other day or every two days. When you do wash, don’t vigorously scrub or scratch your scalp — just rub in gentle circles with the tips of your fingers. Choose a brush with bristles made from natural fibers, or use your fingers to comb through your hair. Brushing too hard and too often can irritate your scalp and increase the dry, static-y feeling in your hair. Choose a shampoo and conditioner designed specifically to treat dry hair. Look for the dry hair formula of your normal shampoo (such as Suave Dandruff Control) or try a product exclusively aimed at dry hair and scalp, such as the Selsun Blue or Head & Shoulders lines of shampoo and conditioner. Look for ingredients like zinc pyrithione, selenium sulfide, or coal-tar. Switching to a salon-grade shampoo and conditioner can also help your dry hair and scalp. These products are more expensive, but also contain less “filler” ingredients; you’ll also want to ask a cosmetologist for help finding the right product for your skin and hair. This will help avoid other scalp issues. Paul Mitchell has a solid Tea Tree hair moisturizer, you can find it at Amazon. Reduce your use of hair products, but do try moisturizing treatments like a leave-in conditioner. Hairspray, mousse, hair gels and styling creams all contain chemical ingredients that, with excessive or regular use, can easily irritate your scalp and damage your hair. Look for products containing less chemicals and more natural, plant-derived, ingredients that will be gentler on your skin and hair. Moisturizing products and leave-in conditioners offer extended treatment and relief for your dry hair and scalp. Don’t use high heat treatments on your dry hair. Blow-drying your hair, styling with curling and flat irons, and washing with hot water all contribute to your dry hair and scalp by drying out and burning off the natural oils produced by your body to keep your skin and hair healthy. Not only that, but they can cause split ends, too! If these treatments are part of your daily regimine, changes are they’re to blame for your dry hair and scalp. Towel- or air-dry your hair. Wash and rinse your hair in lukewarm water. And if you must use a curling or flat iron, apply an extra moisturizing product to your hair before and/or after use. Keep your head covered in extreme weather conditions. 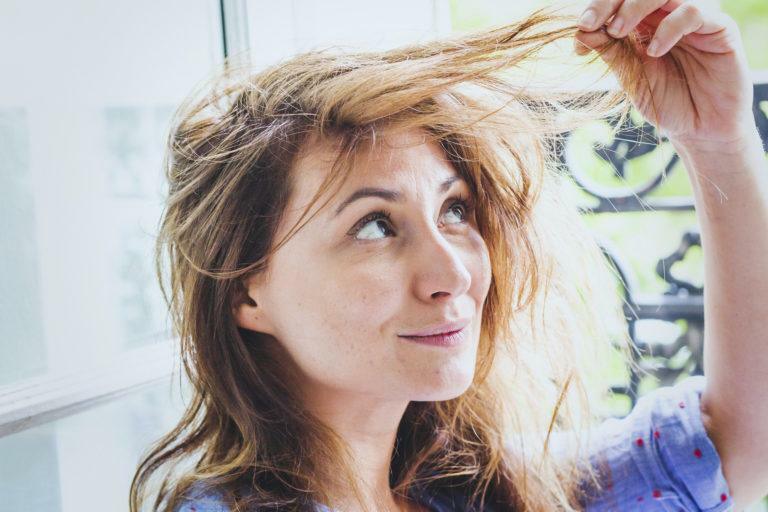 Extreme heat and cold, dry air, strong sunshine, and high winds can all dry out and damage your scalp and hair, just like any other exposed part of your body. Wear a hat or hood to keep out cold and wind; rub sunscreen into any exposed part of your scalp on sunny days; and moisturize your scalp and hair before spending long periods of time outside in harsh weather conditions. Natural oils and herbal extracts can treat your dry hair. Massage olive oil, jojoba oil, or tea tree oil (to name just a few) into your scalp, then wrap your head in a damp towel for half an hour before washing the oil treatment out. A healthy diet can go a long way toward a healthy hair. Choose fresh fruits and leafy green vegetables for at least two meals a day. Add a multivitamin to your diet; Vitamins B and C are particularly important to a healthy scalp and hair. If the air in your home is very dry, use a humidifier to add some moisture. Just refill the humidifier and turn it on every night while you sleep to get a little relief for your dry scalp and hair. Always clean a humidifier between each use to avoid bacterial and fungal contamination. Amazon sells a few single-room units like this humidifier from Pure Enrichment that has a lot of cool features. If do-it-yourself treatments aren’t working or you just don’t have the time or energy for home remedies, consider visiting a salon or spa for professional treatment of your dry hair and scalp. You’ll be able to choose from massages, scrubs, oil treatments, you name it, to fit your time and budget — and best of all, someone else will be doing all the work of treating your dry hair and scalp. A cosmetologist will also be able to recommend and provide you with products containing quality ingredients (most professional salons and spas sell naturally-derived products) directly aimed at getting rid of your dry hair and scalp. Of course, if your dry hair and scalp aren’t responding to treatment, you may be dealing with a more serious problem. Consult your physician for more help if you think you have a dermatological and/or medical problem such as eczema, psoriasis, or seborrheic dermatitis.